A Native American proverb states, “The soul would have no rainbows if the eyes had no tears.” Forgiveness can be difficult, and sometimes it causes us to tear up (in disgust, in fear, in hurt, in anger). But if we allow the tears to come, sometimes there are rainbows to be had. Our Gospel reading deals with the woman caught in adultery. Jesus stooped down and His authoritative word struck conviction of sin in the religious leaders’ hearts. The older ones left first, perhaps because they had the wisdom to recognize the sin in their hearts and lives. Jesus rebuked sin, but He gave the woman hope for a new life. Besides having the divine ability to forgive her sin, His manner of dealing with her was gracious. He was revealed to her as the One who is full of grace (John 1:14). We are so prone to point a finger of accusation. Maybe if we listened more, we just might hear the Lord speak the word of forgiveness that we need to speak on Jesus’ behalf. Prayer: Lord, use me to live and demonstrate forgiveness, in Jesus’ name. Amen. Very good illustration in life. 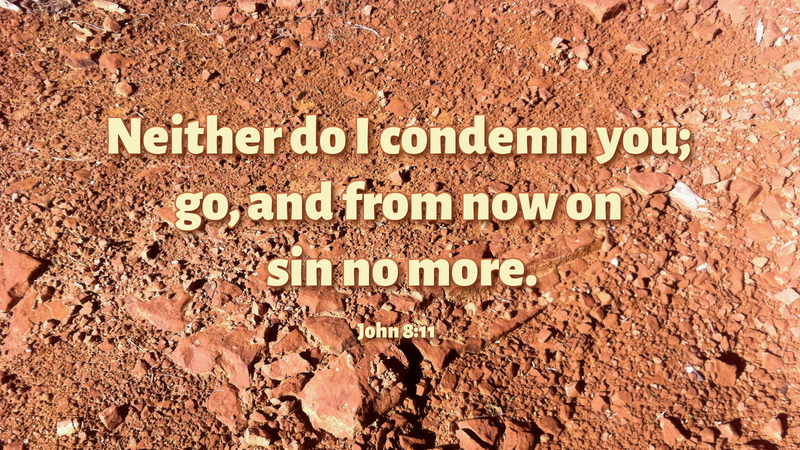 We are always very quick to point a finger of conviction, but rarely do we do as Jesus did, condemn the sin and not the sinner.